Back at home and I just discovered that James Spahn from Barrel Rider Games released White Star, his OSR sci-fi game. The G+ OSR community is buzzing with excitement. The products I bought from Barrel Rider Games so far were always top-notch (take a look at my review of White Box Omnibus), so I was definitely in. The game was released on May the 4th, how fitting! I skimmed through the PDF and I'm sold. Fans of old school role-playing games and space opera sci-fi should take a look at White Star. You can buy the PDF RIGHT HERE (aff) for USD $9.99. A print option will be available soon (at the end of the month?) and if you already bought the PDF you'll get a discount for the print version. I'm not writing a full review here as I normally do but I'll tell you a bit more than "it's awesome". 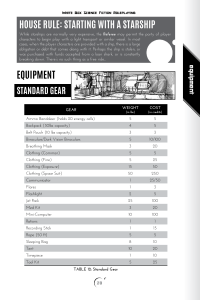 The book comes with 132 pages total (including cover and OGL) and is 100% compatible with Swords & Wizardry WhiteBox. That in itself will tell you a lot about the rules mechanics. Basically, White Star is WhiteBox in space. And I could leave it like that. The ruleset is totally old school D&D, based on the 1974's original system. The game captures the feel of space opera science fiction and some of the gonzo parts of the 70s. Inspiration comes from movies and books like Flash Gordon, Star Trek, Star Wars and Guardians of the Galaxy. In fact, everything (classes, alien races etc.) feel very much like a mix of Star Trek and Star Wars to me. For instance, the Star Knight is a Jedi, the alien race Quinlon are Klingons and Procyons are a raccoon race inspired by Guardians of the Galaxy. If you want to play in one of these settings and are willing to go with D&D, White Star has you set right from the start without a need to adjust things. The classes easily model the typical tropes. You have the charming Aristocrat, a Politico, the martial Mercenary, the dashing Pilot and the afore-mentioned Star Knight. Alien classes are generalized into Alien Brute, Alien Mystic and Robot. Although I'm not too fond of the race-as-class-mentality I must say that White Star's approach works fine for most character concepts. (Fellow blogger and Basic-Fantasy-fan Brian attempts to fix that by using Alien Knacks). The game comes without psionics but Star Knights and Alien Mystics still have access to "magic powers". They both have a fixed set of "spells" available to them and must prepare them in advance. Star Knights use Meditations like Charm Person, Detect Invisible, Heal Other or Expand Senses. Alien Mystics have Gifts like Light, Hold Person or Alter Time. Folks who have played D&D will feel at home. In addition to the normal combat system (again, it's S&W WhiteBox) there are also rules for space combat. The mechanics are mostly the same but scaled up to starships. I like how easy it feels to learn the system as it is basically the same you already know. Equipment and starships look adequate to me. The GM also has access to a small bestiary of alien lifeforms. Advanced Equipment is only available later in a campaign (i.e. Cybernetics) so there's definitely something to look forward to in a longer campaign. White Star also comes with setting ideas and a fleshed out sector to play in. Moreover, there is a sample adventure. Besides these, the game doesn't have a pre-generated setting but asks you to create a sandbox. In contrast to Stars Without Number (SWN) by Kevin Crawford there is no exhaustive system for building your sci-fi sandbox. That means you need to come up with your planets, alien cultures and societies yourself. Also, there are no random tables or other generators for different encounters (starship encounters, hooks for adventures or similar). So while White Box is a sandbox it isn't the swiss army knife of old school space opera. If you're looking for a more "complete" toolkit, SWN is the way to go. However, White Box stays in the spirit of its parent WhiteBox: Matt Finch's rules-lite game is also quite bare-bones but still sufficient. There just isn't much support when it comes to adventure/sandbox-building. The design and layout job are well done and convey the tone of the space opera genre very well. Everything is good to read, the font and the border are very appropriate for a sci-fi book. I like how the boxes and chapter headings look. The artwork is nice but not spectacular. The book is completely done in black and white (except the cover). And the cover somehow reminds me of Firefly's Nathan Fillion! The price point may be a bit steep considering you can get similar products for fewer bucks (Stars Without Number Free Edition or Hulks and Horrors, to name a few). That said, White Star is its own distinctive game. It's one of the games where I don't feel intimidated by the rules and where I really want to start playing. 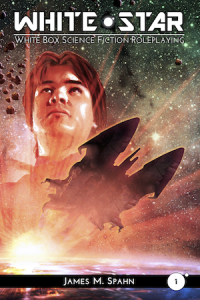 White Star is a well-written space opera game with OSR rules. It's totally compatible with Swords & Wizardry WhiteBox and thus with a range of old school D&D systems. The strength of the game is that it can be played as-is with a wide range of well-known settings. The toolkit part of the sandbox approach falls a bit flat. Nonetheless, White Star is an interesting ruleset if you want to play D&D in spaaaace! And if old school D&D is not heroic enough for my taste (remember that 1st level characters in S&W WhiteBox are a bit squishy), I'm taking a page or two out from Scarlet Heroes (aff) to fix that.